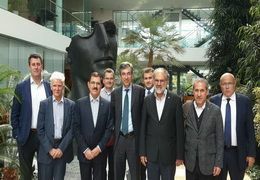 NPC CEO Reza Norouzzadeh met with senior Casale officials and discussed with them licensing and offering the technical knowhow of petrochemical projects required by Iran's petrochemical industry. After the meeting, it was decided that the Swiss company offers a list of its propositions for offering new licenses to petrochemical projects in Iran. Also, Casale was called on to maintain the level of its cooperation with Iranian partners and provide technical and engineering services to projects which run by its licenses. CASALE is a privately owned Swiss Company, wholly owned by CASALE HOLDING, with headquarters in Lugano (Switzerland). Address: No. 53, Mansoor St. Motahari Ave.